Very litle information was available about previous classes that had been offered, unless one wanted to go through the old paper catalogs. This made planning an academic career difficult because one could not tell what classes were likely to be offered in the future nor what classes had been offered that one might be interested in taking. I developed the catalog tool to offer views into what had been offered, when and in a way that helped for getting an idea what the academic field looked like. The assignments given by each instructor, especially in the core classes from the first three quarters, involved a great number of deadlines for both individual and group work. However, each instructor would provide these deadlines in different formats, sometimes embedded in disconnected locations in their syllabus for the course. Students devised their own forms for record keeping, which is duplicated work. So, I devised the assignments tool to help students keep track of these various, and diverse deadlines. Two views into this data are provided. The first is a typical "To-Do" list. The second is arranged by weeks, with the three core classes each quarter shown side-by-side. Residencies are shown between the weeks where they occur. Assignments, due dates, and the placement of residencies are all arranged programatically from the data available in the database. A primary component of the second year for C3 programs is the change project. The change project is a real-world experience that is used reciprocally with the thesis. This helps to make sure that the theory being explored by the student is grounded in reality. The change project is undertaken within the context of some organization. 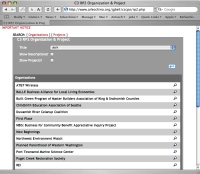 For those students that need to find an organizational partner, a database can be useful. The RP2 Projects Database is for this purpose. I developed the tool to offer views into both organizations and potential projects. In response to the needs of the university, I ported my original PHP/MySQL project to Lasso/Filemaker. I determined that, at that time, the university did not have the infrastructure or internal support for a delivery platform other than Lasso/Filemaker, and ported the project in order to help make the code sustainable for that organization.